32949 1st Battalion Essex Regiment. Sidney Sargent was born in Great Cornard around 1885. He was the son of James and Hannah Sargent and in 1891 the family were living in Vicarage Lane, Great Cornard. By 1901 Sidney’s father was married to Alice and the family had moved to Phillips Field. His father was employed as a maltings labourer. Sidney enlisted and served with the Essex Regiment. The 1st Battalion was attached to the 88th Brigade, part of the 29th Division and saw action at The First Battle of the Scarpe (9th – 14th April 1917), the first phase of the Battle of Arras. A report in the Suffolk and Essex Free Press on 6th June 1917 listed Sidney as ‘missing’. He was officially reported as killed in action aged 32 on 14th April 1917. 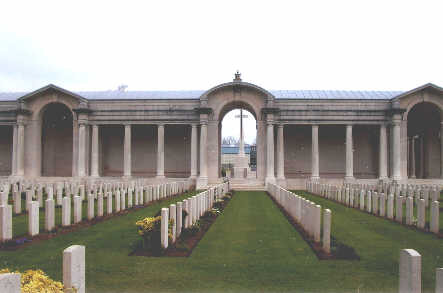 There is no known grave and Sidney is remembered on the Arras Memorial located in Faubourg D’Amiens Cemetery, Arras, France. The Arras Memorial bears the names of 34,719 casualties who lost their lives between the spring of 1917 and 7th August 1918 and who have no known graves. The majority of these casualties are from the Arras Offensive of April – May 1917. Sidney was awarded the British War Medal and Victory Medal. A Cross of Remembrance was laid at the Arras Memorial on 30th March 2007.